To the top ten list, the most beautiful restaurants in Italy (look the weekly Panorama, on April 7th 2005, and the column Gusto TG5 on June 2004) the restaurant is characterized by a splendid dehorn above the sea with 10 tables, reservations welcome, at least 2-3 days before. Always, you can admire the splendid view from the terrace, with amazing sunsets, waiting for the particular green flash! Big cellar, about 700 firms, served in goblet, refined choice of spirits, very good desserts and coffee at the terrace above the sea, where you can spend pleasant evenings to end a magic day. 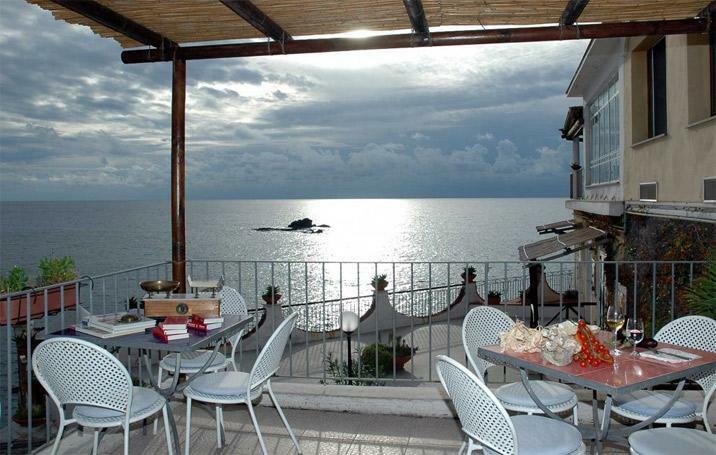 Don't forget to visit the small Albergo Umberto a mare. Above the sea, dug into the promontory of Soccorso, in the town centre, at 20 m from the famous church of Soccorso.